Living in London, I try to make a trip to South Africa (especially Cape Town) about every 18 months. Since it seems like I have become an advent WordCamp goer, I managed to plan the last trip around WordCamp Cape Town, 10-11 September 2015. It was held at the newly renovated The River Club, which is also a golf driving range. The first day was a typical winter rainy Cape Town day, sticking to indoor activities. The talk format of the first day was divided into two types of Workshops, focussing on the developers on the one side and users on the other side. For most of the day I visited the developer side of all things WordPress. Starting off with setting up a local development environment using tools such as VVV, WP Make, WP-CLI, Gruntjs, Xdebug and more. This followed by Drew Jaynes’ talk on Getting Crazy with WordPress Queries. I found this talk insightful, going over all the types of WordPress queries and what you can do with it. Below are the slides. The talk I attended after lunch was also of great interest to me – An Introduction to the WordPress Customizer. Marc Perel gave a good explanation about the WordPress Customizer taking over from the Theme Options panel. It provides a live-preview interface for themes, which can be really handy for developers and their clients doing theme options on the fly. He went through the basics of programming with the WordPress Customizer API and also made code available on Github to get me started! The day ended on a high note with Justin Sainton’s talk, giving an introduction to the WP-API. His presentation was packed with all the starter info and some code examples using this API. Below are the slides. The last day of the conference the weather was on our side, with loads of sun and blue sky. This was also perfect for WordCampers to make use of the driving range facilities at The River Club. The day was hosted by the funny duet Derick Watts. Besides catching sun outside, this day consisted of one track, focussing more on general WordPress topics, WordPress community and a panel talk. Bruce Lunnis’ (photo below) talk in the morning, The Age of the Digital Superhero touched on some really important topics, such as our world where poverty, hunger and unemployment are rife, how we are living in a time of turmoil on a planet that we are slowly killing. He showed how people and organisations use WordPress to make a real difference in people’s lives. Definitely one of my favourite talks of the day. A big highlight of the day was the panel talk on e-Commerce in WordPress. On the couch was Justin Sainton from WP eCommerce, Mark Forrester from Woo Commerce, Pippin Williamson from Easy Digital Downloads and Roslyn Lavery from PayFast in South Africa. Werner van Rooyen from BitX (a bitcoin company) was the host. 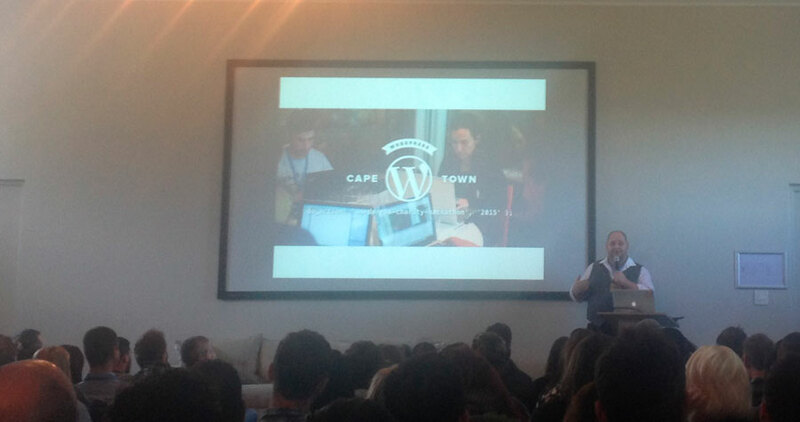 To wrap up WordPress Cape Town, a few talks after lunch also stood out for me. First up, another talk by Drew Jaynes, It Takes a Village to Make WordPress. It was a good peek under the hood of WordPress, running through the whole process of a major WordPress release. This followed by a very sweet talk by Joel Bronkowski, WordPress in Africa: Voices and Insights From A Growing Community. A special insight by an American living and working in South Africa. And how he has also reached out to other WordPress communities in Africa such as Nigeria. The day ended by a bit of couch surfing on stage and a closing talk by the amazing organiser, Hugh Lashbrooke. This was shortly followed by the afterparty (and more golf for those who can… and can not…), because a WordCamp can not be a proper WordCamp without an afterparty.